Posted by cath in mildly spicy, Recipes, variations, vegetables, very spicy. My recipe for chilli is slightly inspired by Thai cuisine as I used to eat these very hot chilli con carnes out in Thailand. The recipe is quite spicy, with lots of fresh chillies, coriander and lime. Its nickname is “Tom Yum” Chilli because my Thai friend thought that it tasted like the hot and spicy Thai soup. Of course you should adjust the amount of chilli to your tastes. This recipe below is actually a fantastic vegetarian chilli san carne, or you could try a variation with meat if you prefer. Add guacamole and salsa, some tortilla wraps or chips to accompany the dish. 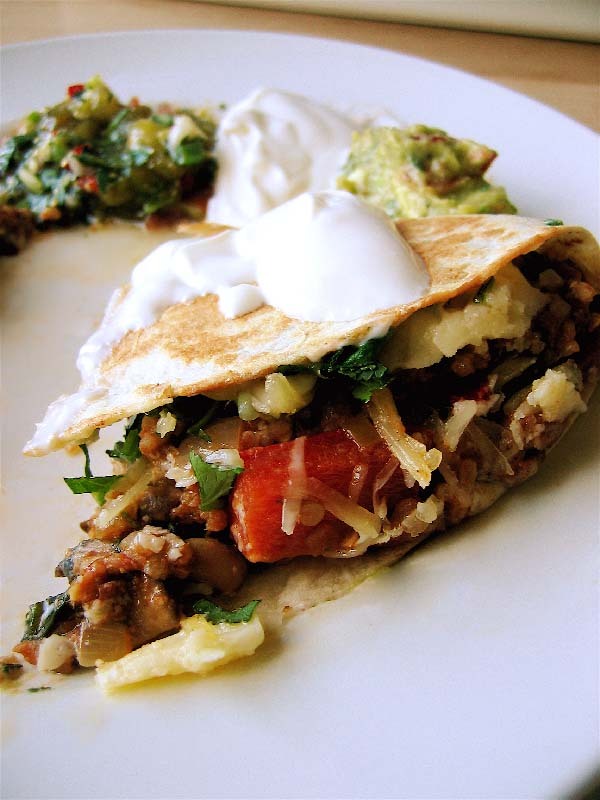 You can use the basic stew recipe to make a variety of different Mexican inspired dishes…like this toasted chilli wrap. Heat a large pan, add a few tablespoons of oil (like Oleifera), you may need more as you cook all the vegetables. Fry the onion on low-medium heat, stirring occasionally. Just start to soften the onion, not brown it (about 5 minutes). 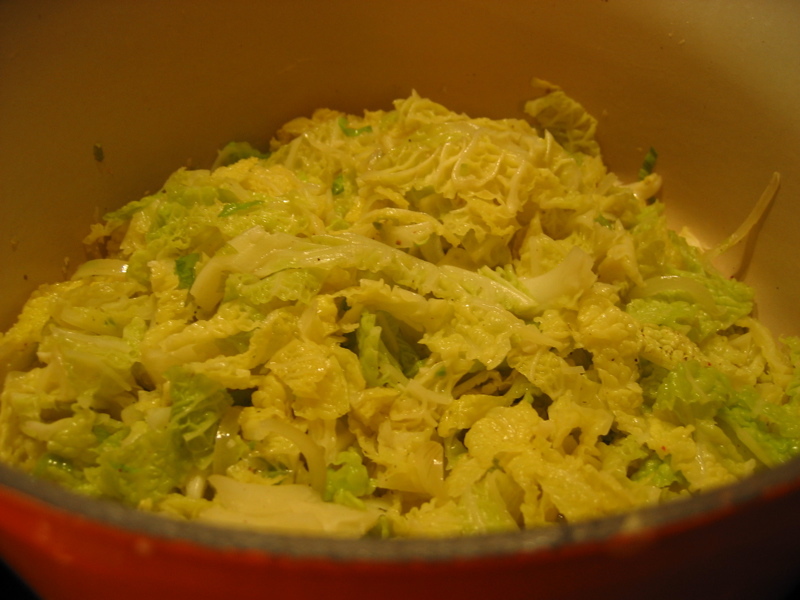 Add the celery, leek and again fry off gently until they begin to soften (about 3 minutes), stirring gently. Then add the grated carrot and beetroot, fry, stirring gently – add a spoon more oil as required but don’t make it too greasy. Add the garlic, and taking the stalks and root from the coriander (save the leaf for later), chop finely and add to the pan. Stir again. Now add the spices to the pan, the bay leaf and the dried oregano, a sprinkle of salt and pepper. Mix well and let fry gently for a minute. Get the crushed aduki and black eye beans, and the lentils and stir them into the pan with the spiced ingredients. Mix everything well. Add the wine, stir and let the alcohol evaporate. Add the tomatoes, break up the tinned tomatoes with the spoon. Stir well to combine. Add a large glass of water, and keep some at the side to add as required to loosen the mixture. Add the chopped mushrooms and fresh oregano if you have it. Simmer the dish with the lid partially on for 45-50 minutes, stirring occasionally, adding extra cold water if required (particularly if you are cooking lentils). With 10-15 minutes to go before you serve, add the peppers, check the seasoning and add more fresh chilli if required to taste. Add the drained kidney beans to heat through. With 5 minutes to go, stir in the spinach to wilt. Then remove from the heat, finish off with chopped coriander leaf and lime juice. Chilli is lovely with just mixed beans and vegetables as in the ingredients shown here, but you could also make it with pork or beef mince. Just substitute the meat for some or all of the beans and lentils. Add meat at the frying stage. You can make chilli in advance as well. Remember that any beans in the dish will have continued absorbing liquid and flavour, which means you will need loosen the sauce with some extra cold water as you reheat it. You can use any type of bean, or a mixture of different beans and lentils as I’ve used here. To save time, I usually use tins of pre-cooked beans, which will disintegrate more into the dish, but I also add some uncooked lentils to balance the different textures. Simmering the tinned beans gently in the sauce allows them to soak up the flavours. If you have time you could use dried beans and make everything from scratch – that way they will absorb even more flavour. You can add any root vegetables you like – just grate and sweat them off in the base – they stew and melt into the sauce adding lots of flavour. Chunks of mushrooms and peppers make a good addition to the dish, although you could use other vegetables – just put them in the sauce at the appropriate time to cook them through. If you have any, you can also add some chopped fresh tomatoes at for a minute or two at the end of cooking for a fresher flavour (in season). Or try a tin of Mexican green tomatillos. Posted by cath in Fish, freeze-friendly, ingredients, mildly spicy, Recipes. This is a recipe I made a few times, and each time I forget to photograph it. Oops. I’ve now made it with some monkfish, and with chicken (thighs/legs – skin, bones and all), lamb or mutton works a treat, and is definitely my favourite. I also tried mutton and aubergines and it worked really well. I have never been to Morocco, but apparently this tastes authentic (and of course really delicious!). I tend to add plenty of vegetable to my meals, and this tagine can also have other ingredients added to it. Try adding spinach (just stir in plenty at the last minute and heat until wilted) or baby carrots (added for the last 8-10 minutes of cooking). Try other seasonal vegetables as well. For the charmoula I borrowed a recipe from Rick Stein’s Seafood and made some amendments, particularly to the amount of chilli – but this is still a mild dish. 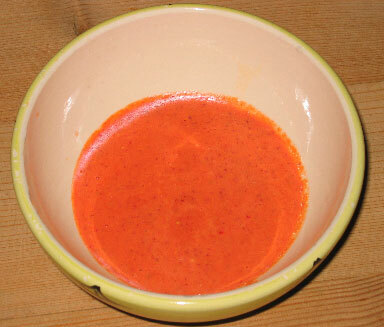 For those of you who like it hot, I’ve also added a cheating harrissa style sauce which is easy and quick to make. Use it to add some extra chilli flavour to your dish and/or plate – it also makes a great dip for bread or pita. 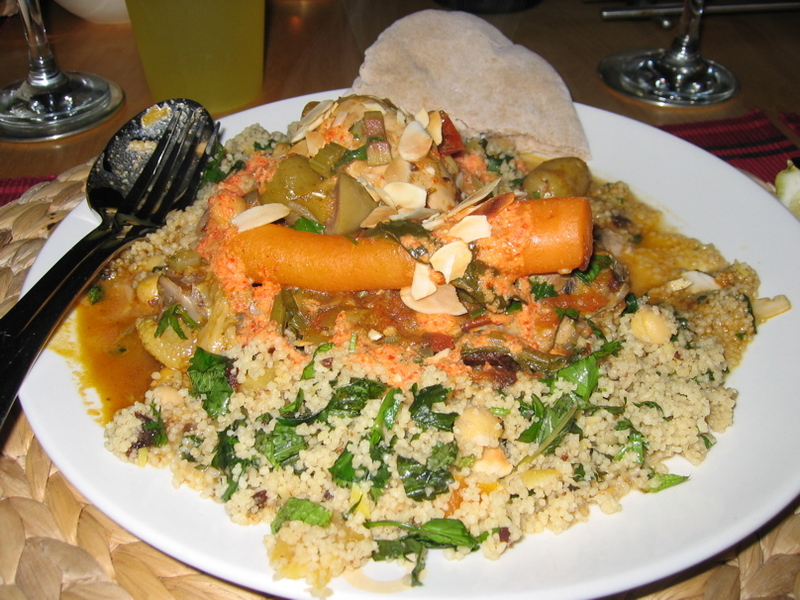 Serve the tagine with some couscous, one idea for that is at the bottom of the page. This makes a large stew, good for 6-8 people. You will need about 600g fish, or 1-2 chicken thigh (or leg) per person or about 1kg of lamb or mutton (shoulder cut into large chunks) – up to you! Sweat the onion, celery, garlic and ginger in some olive oil, long and slow until very soft but not browned. While the base is cooking slowly, make the pastes. 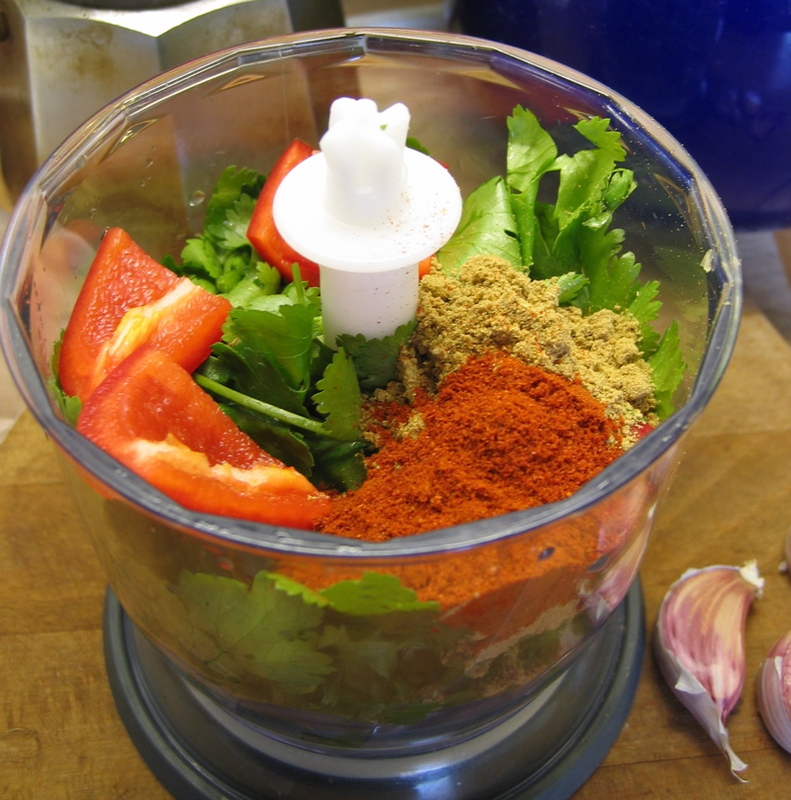 Blend all the ingredients for the harrissa in a mini-processor or similar. It should be a thin paste. Taste and adjust seasoning if required. Set aside. Then blend together all the ingredients for the charmoula – use the same processor, no need to wash out. Again this will be a thin paste. Taste, adjust seasoning and set aside. Add all the charmoula paste to the pan with the cinnamon stick and a few spoonfuls of harrissa (to taste, adding heat, garlic and lemon). Stir well and let fry for a minute. Add the raw meat (chicken or lamb) now and stir round in the charmoula to cover. (For fish, just add the fish later to gently cook through before serving). Add the tomatoes, stock, wine, lemon rind, dried fruit and half of the chopped olives bring to the boil and simmer gently with the lid on. Add the potatoes and simmer for the final 40 minutes. You will need to simmer the dish for at least 40 minutes to get the flavours to blend and cook the potatoes. Then add the chickpeas and heat through. You will need to adjust the total cooking time depending on your choice of meat or fish: chicken thighs or legs on the bone (approx. 40mins-1 hour); stewing lamb or mutton (3 hours or more); large chunks of monkfish (10-15 minutes at the end after the potatoes are cooked). After the meat or fish is cooked, remove from the heat. Sprinkle over the other half of the olives, coriander leaf. 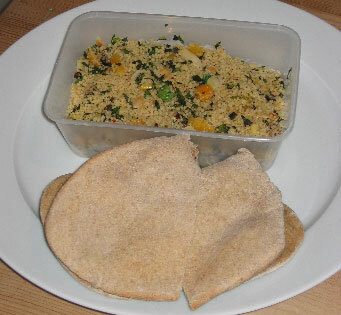 Serve with a wedge of lemon, the harrissa, olives, pita or other fresh bread and some couscous. Chopped dried fruit, e.g. apricots, prunes, sultanas etc. Heat the stock until boiling then pour in the couscous and the lemon rind. Stir and remove from heat, covering with a lid or foil. Leave for 5 minutes. Remove the lid, fluff up the grains with a fork. Return the couscous to the heat, drizzle over olive oil and chickpeas. Cook gently for 2-3 minutes. Fold in almonds, fruit, herbs and season with some harrissa to taste. You can reheat the prepared couscous again in the microwave or in the oven, but it’s best to add some fresh herbs at the end to liven up the flavours again. Place all the ingredients together. I use the pizza dough setting on the breadmaker (this is a 45 minute program consisting a 10-15 min knead, 10-15 min rise, then another 10 min knead and 10 min rise – so probably easy enough by hand for those who want to try that). Divide the dough up into 4-6 balls, roll them out into oval shapes of about 5 mm thickness. I’ve been told the secret is to make sure you roll them out on both sides – this ensures they puff up to create the classic pocket. Prove for 8-10 minutes (I have also left them longer and that’s been fine, or put the dough balls in the fridge overnight to use the next day). Bake in a very hot oven (220 degC or higher if you can) for about 6-8 minutes and serve immediately. You can reheat them, but they can easily crisp up a bit too much, which is why I prefer to reserve some dough in the fridge to freshly bake with any leftovers. Hope you enjoy my Moroccan feast! If you have a breadmaker, check out the pita bread, or flatbread recipes. They are very quick an easy and go really well with this dish. P.S. comments as usual are welcome – particularly any mistakes, or anything you don’t understand. 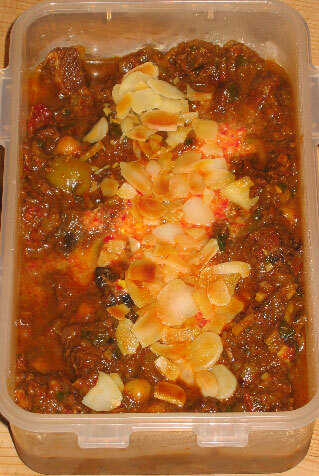 Print the text of the ingredients and recipe: Moroccan Tagine (Opens a .doc file). Posted by cath in mildly spicy, Recipes, stir-fry, variations, vegetables. This isn’t the battered pork balls that you may think of when you think of sweet and sour pork – instead, this is a Thai/Chinese fusion of healthy, local, in season vegetables, with lean pork, stir fried in a spicy sweet and sour sauce. 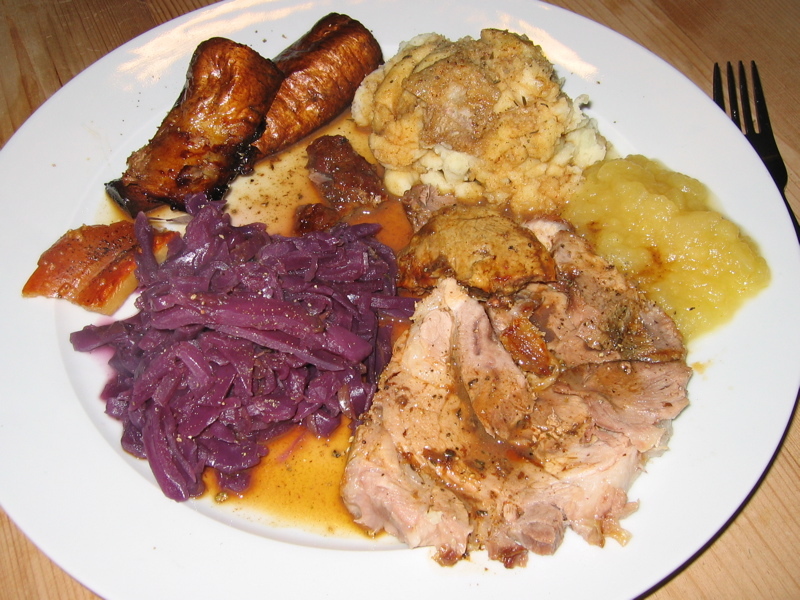 I like to try and encourage home cooking, and all in one dishes are a popular choice. The stir fry, although Asian in influence is made with mostly local produce – carrots, courgette, Savoy cabbage, sprouting broccoli, onions, garlic, mixed mushrooms, tomatoes and fresh coriander. The only imported ingredients are my chillies and ginger – not bad. Any lean pork will do, here I’ve used tenderloin – that’s like the fillet of beef in pork. The meat has a mini-marinade before cooking. This is often the case with Chinese recipes and can be done for as little as 5-10 minutes, or you could leave it longer but not overnight. I usually prepare the meat first then leave it to marinade for a bit whilst I chop the vegetables. The sauce is easy – I’ve used it before. a dash of tomato puree for colour. Just mix it together in a bowl and set aside. Thinly slice the pork and combine it in a bowl with 1 tbsp dark or light soy sauce, 1 tbsp Shaoxing rice wine (or you can use white wine or dry sherry if you have it) and 1 tbsp sesame oil with 1 tbsp of cornflour. Chop the vegetables – carrots, courgette into thin sticks, cabbage thinly sliced, small sprouts of broccoli trimmed, slices of mushroom. You can chop more than you need for one night and keep half aside for an even quicker meal the next day. (If you have this dish with noodles rather than rice that also makes it quicker). 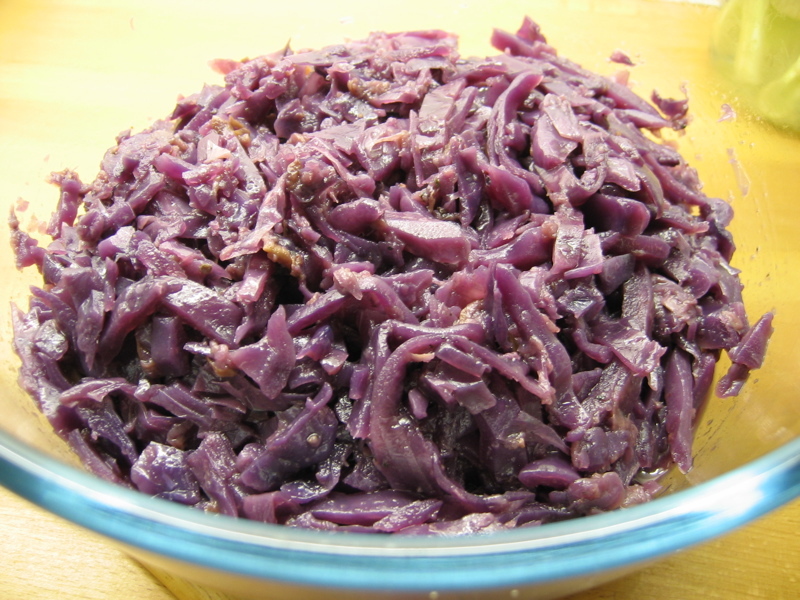 Chop the base ingredients – thin slices of onion (red or white as you like), garlic and ginger. Chop a couple of tomatoes if you still have some from the “summer”, some chillies (2 large red chillies is a good heat) and some coriander stalk and leaf. Drain a tin of pineapple (natural juice or fresh if you can get it) and chop into bite-size pieces. When you’re ready to cook, start with the rice. The stir-fry will take only 5-10 minutes to complete, so when you’re ready to begin cooking, heat up the wok with a little oil (groundnut is good) in the base. Heat it up well, then add the sliced onion, followed by garlic and ginger. Stir fry for a few minutes but do not brown (particularly the garlic). You can add some chillies here if you want it hot and spicy. Then add the marinaded pork and stir fry on a medium high heat for 2-3 minutes until nearly cooked. You can choose to remove the pork, onions etc. now if you like – to stop the meat drying out and to give you more room for the vegetables – remove and leave on a warm plate. Now add the carrots, mushrooms, then broccoli, cabbage and finally the courgette (add them in the order of size and crunchiness – carrot usually takes the longest unless it’s been grated.) Use the remaining pineapple juice and water to loosen the stir fry rather than adding more oil. Stir fry until all the vegetables are cooked. Then put the pork back in the wok with the sauce and stir through, heating the sauce. Finally, add the pineapple, tomatoes and decorative chili slices. Sprinkle fresh coriander on the top and serve with the rice. Posted by cath in easy, freeze-friendly, mildly spicy, Recipes, summer, variations, very spicy. I’ve been growing chillies in the hottest, sunniest window of the house. Yesterday was finally time to try the first fruits. I’ve got a mixture of red, purpley and still green chillies on the plant, so we tasted a bright red and a green one. First make your basic tomato sauce with 5 or 6 tomatoes per person. 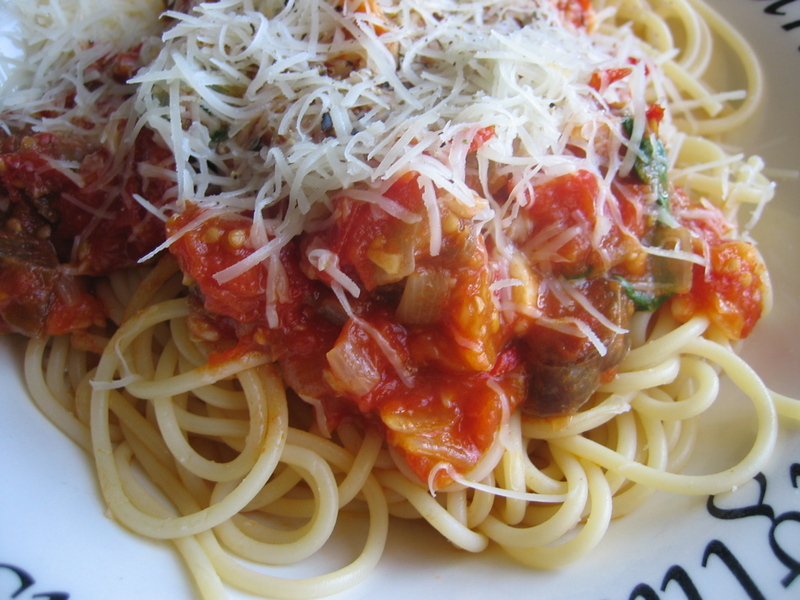 Once the tomato sauce has cooked for an hour, put on the spaghetti in a large pot with plenty of boiling water. Use about 2 chillies per person, or to taste. 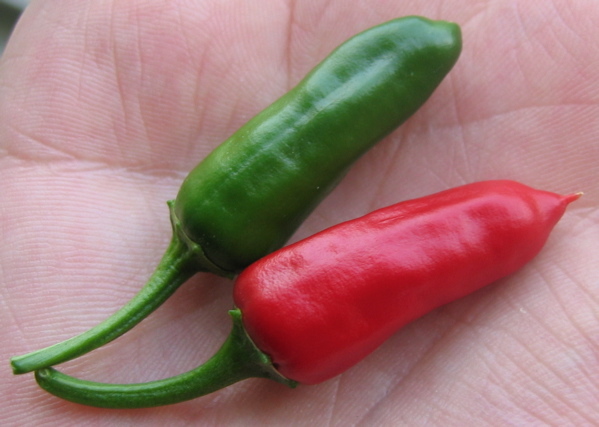 Two of my fresh homegrown chillies were sampled – very hot and fiery with a lovely fresh taste and amazing smell, 4 of these in 2 portions gave a pretty spicy dish). The red chili was hot but mellow and slightly sweet, the green chili was slightly hotter and fresher, more zingy in flavour. You’ll also need a handful of basil, some grated Parmesan-style cheese, pepper and extra virgin olive oil. I’ve also used some chorizo, but this is optional. Posted by cath in easy, mildly spicy, Recipes, Thai food, variations. A really easy way of cooking joints of chicken on the bone. 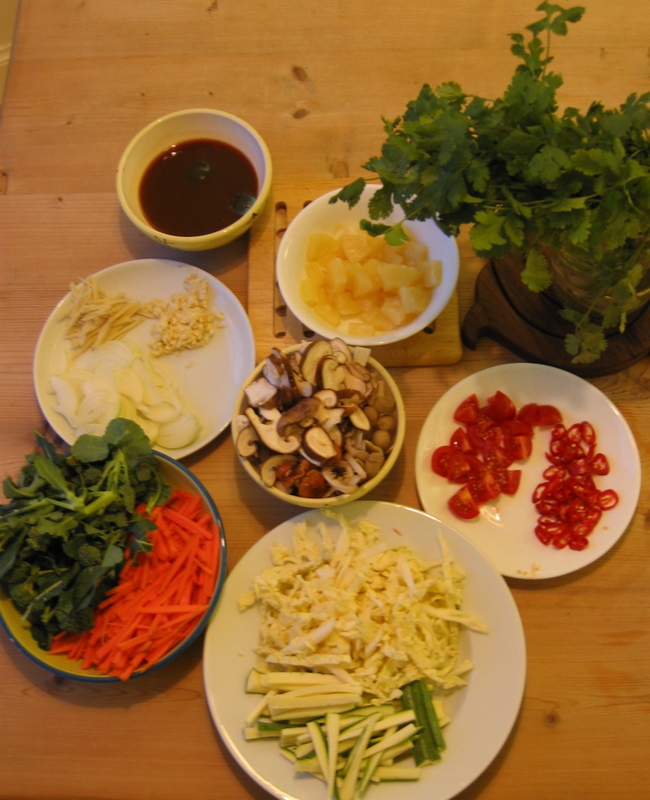 The flavours can be adapted to almost anything from Thai (shown here) to Indian, Mexican, Italian by adding different herbs, spices, oils and liquids. Follow the instructions and you will get both tender, succulent chicken and a golden, crispy skin – yum! Serves 4 as a snack or starter on it’s own or as a main meal served with steamed rice, stir-fried vegetables and a tomato and mint sauce. Using a large roasting dish, place a large piece of tin foil inside and brush with a bit of oil. Make sure you have enough foil to create a closed pocket around the chicken for the first stage of cooking. Place the chicken into the foil-covered dish. Then add chopped ingredients except the coriander leaves (reserve for later). Add the liquids, oil and sugar. Mix well, ensuring each chicken joint is well covered and the lime chunks are spread out in the tin. You are aiming for a moist, chunky marinade, do not add too much liquid at this stage. Fold the tin foil into a loose fitting parcel and twist the edges together to form a tight seal. The mixture can be left to marinate for a short period (30 mins) or a few hours as desired. When you are ready to cook, heat the oven to 180 degees C, then add the chicken parcel and bake for 30 mins. During this stage, the chicken is steaming, rather than roasting in the oven. If you’ve left the skin on the chicken, you’ll definitely want to brown the dish before serving. Remove from the oven, turn the oven up to 190 or 200 degrees C and open up the top of the parcel. 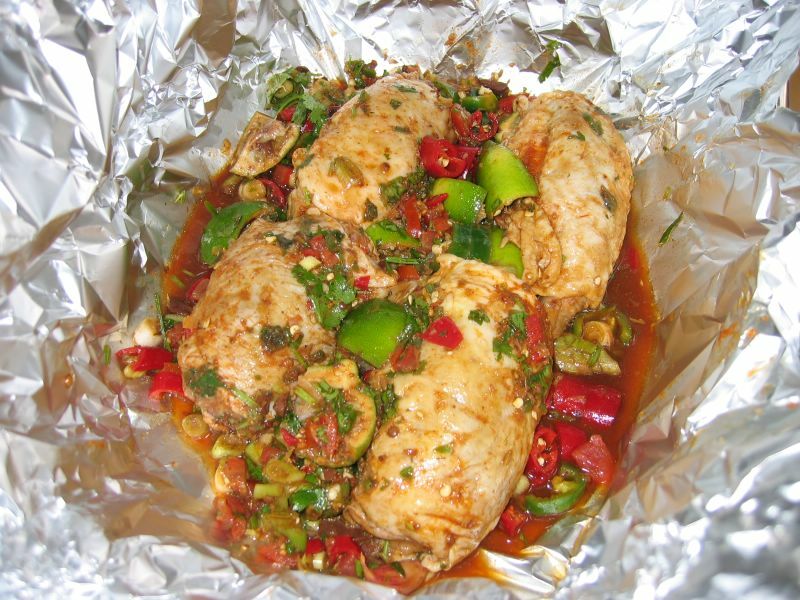 The chicken should be cooked, so you just need to place it back in the oven uncovered to brown, this may take up to 15 minutes, this also reduces the juices down to a delicious spicy sauce. Serve hot from the oven, drizzled with the sauce and garnished with coriander leaves. Alternatively, serve cold with salad or in sandwiches. Here’s what it looks like after marinating, just seal up the foil and its ready to cook. Serving this as a main meal it goes well with rice or noodles and with stir-fried vegetables such as broccoli with sesame seeds on the side. 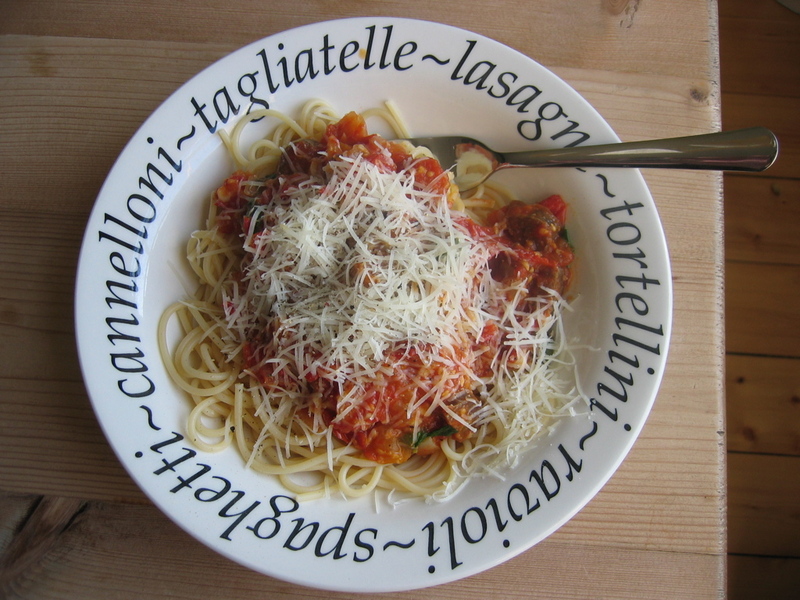 For those who like it spicy, a mint and tomato sauce can be made as a cooling accompaniment. Simply add some chopped tin tomatoes or peeled and chopped fresh tomatoes to a small pan or frying pan, add some finely chopped mint and a sprinkling of sugar and heat through. Mexican flavours: lime, garlic, fresh/ground coriander, spring onion, chillies, dark chocolate, lots of crushed cumin seeds, peppers, etc. Italian flavours: aromatic herbs (i.e. thyme, rosemary), lemon, peppers, tomatoes, bay leaf, chillies etc. Indian flavours: coriander seeds, cumin seeds, tumeric, cloves, cinnamon, fresh coriander, chillies lemon, peppercorns etc. Other ideas: Simply use your favorite flavours, herbs and spices to create your own version. 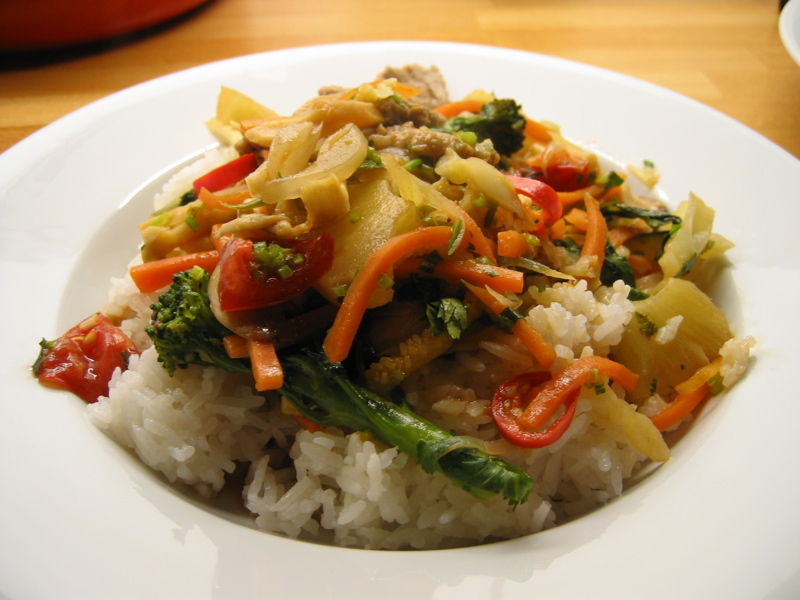 Posted by cath in mildly spicy, Recipes, stir-fry, Thai food, variations. Put the oil in a wok and fry the garlic for a minute or two until golden, add the onion and stir-fry for 2 minutes. Add the cauliflower and carrot and stir-fry for about 3 minutes, then add the courgette, baby corn and stir-fry for another 2 minutes. Add the chillies, tomato and continue to stir until the vegetables are cooked (doesn’t take long). Add the pineapple, the sweet and sour sauce and stir to combine and heat until bubbling (this won’t take long in a hot wok). Then add the beansprouts and stir well again. Serve immediately with steamed rice or noodles. Keep some of the pineapple juice or a cup of water by the wok. Use this instead of more oil to add to the ingredients to keep them loose in the wok. This allows the vegetables to steam-fry and reduces the oil content of the finished dish. To get the most lime juice from a lime, just give it a quick roll on a chopping board with gentle pressure before cutting and squeezing it…this really works! This dish can also be made by adding strips of meat to the vegetables, stir-fry the strips of chicken, pork or beef in the garlic and onions and remove from the pan but keep warm. Then adding any seasonal vegetables and stir-fry as above. Return the cooked meat to the pan to combine at the end. You can also use up pre-cooked meat in this dish, left-over roast chicken works well. Try marinading the cold chicken for half an hour or so in a little soy sauce, sesame oil and add a sprinkle of sesame seeds, before adding to the stir-fry to heat through. You can use any vegetables that you like (or that are in season) in a stir fry. Simply cut a selection of veg into similar sizes and shapes. Start with the hardest, crunchiest vegetables as these tend to be the longest to cook (e.g. carrots, cauliflower, jerusalem artichokes) and add the more delicate vegetables towards the end (such as finely shredded cabbage, green beans, peas). Instead of long white beansprouts – I’ve also used mixed sprouts such as lentils, chickpeas, aduki beans. You can make these easily yourself or buy them ready-sprouted from some supermarkets and health food shops. If you like this, try my recipe for sweet and sour pork, with more ideas and variations for stir frying.